A brand new, free wiki plugin is on the scene with truly convenient front-end editing capabilities. 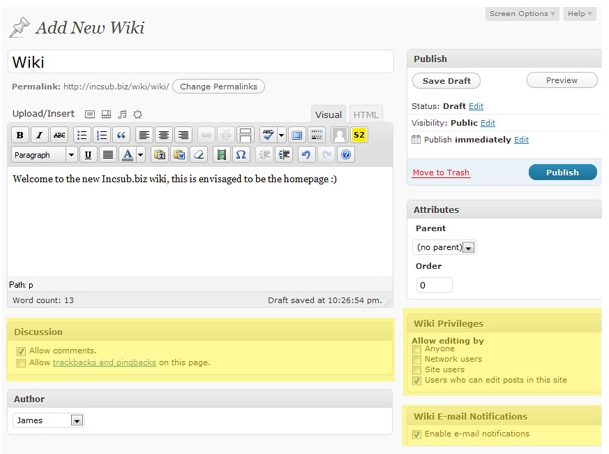 Wiki Lite has just hit the WordPress repository and it allows you to transform your site into a fully functional wiki. This plugin gives you all of the functionality you would expect from any major wiki platform but without all the hassle of having to install wiki software alongside your blog. The Wiki plugin is Multisite-Compatible – Create a Network of Wikis! One of the cool features of this plugin is that it was created with multisite installations in mind. That means that you can use it to host multiple wiki sites. Each blog or site on your network can have its own separate wiki. The WordPress Wiki plugin comes with a clean, easy-to-use interface right out of the box but can also be styled to match your site. It’s powered by custom post types, so you can theme it just like you would any other WordPress content. With built-in WYSIWYG editing, upload capabilities, and comprehensive notification systems, you’ll be hard-pressed to find a more full-featured wiki plugin for WordPress. Install and activate Wiki Lite to give it a try today.